Twinspires is founded by the trusted Churchill Down Company, who host the Kentucky Derby. They are a legal and licensed to take online horse racing bets in the majority of US states. The site is ranked among the top horse race betting sites in the world, offering hundreds of tracks and thousands of races on a weekly basis. Another key feature of the site is the robust mobile app which allows users to place bets on the go. Twinspires provides a wealth of resources in the form of handicapper picks, horse and jockey information, and even race replays to ensure that bettors have all the data they need to place winning bets. Live streams of all races are also available on the site. For more information about Twinspires, read the full review below. Only brand new customers to the site will have access to the Sign Up Bonus. Existing bettors will not be able to activate the bonus. New customers must create a Twinspires Account prior to claiming the bonus. To get the 20% Sign Up bonus, bonus money will be credited to your account for every $100 wagered on the site. For example: if you bet $200 on Twinspires, you’ll get two installments of $20, one for each of the hundred dollars wagered. This can be done up to a maximum of 5 times for a total of $100 in bonus money. You must opt-in to the first deposit bonus prior to creating your Twinspires Account. Visit the Twinspires site and click on the ‘Join Now Free’ button on the left side of the homepage. You can take a quick tour before registering by clicking on the ‘Take a Tour’ button. Once you click the “Get Bonus” button, you will be transported to a registration form. The first part of the form requires that you enter personal information such as Full Name, Cell Number, and E-mail. Press the ‘Continue Joining’ button after you have finished. The second part of the form requires that you fill in your mailing address. You also need to provide your Date of Birth and the last 4 digits of your SSN. Once again, click the ‘Next’ button after you have filled out the fields. In the last section, you must create a unique Username and Password which will be used to login to your account. You will also be provided with an ‘Offer Code’ space, however, there are currently no active offer codes for Twinspires. Click the ‘CREATE YOUR ACCOUNT’ button to complete the registration process and accept the terms and conditions of the site. The no deposit bonus should now be available. A deposit menu will pop-up in your browser and you may choose from a variety of different payment methods to make your first deposit. After you have made a deposit, you can sign in and start wagering. The 20% Sign Up Bonus will automatically be credited into your account. For every $100 wagered on the site you will receive $20, up to a total of five times. In other words, you wager $500 and receive $100 free. If you run into any issues claiming your bonus, you can contact the Twinspires Customer Support Team for assistance via phone or email. The Twinspiries site has been built with convenience in mind with quick links to deposits, wagers, and betting tools on the side menu bar of the homepage. Also find the TV stream, promotions, rewards, and other news in the main menu bar at the top of every page. For quick bets, upcoming races are presented for wagering down the middle of the homepage. Customer support is always found on the ‘Support’ button at the end of the main menu bar. All in all, the site keeps things simple by providing easy access to the most visited features. Placing a bet at Twinspires is straightforward with a quick, one-click system. All you will need to do is click on the odds of the horse you would like to bet on from the list of horses and a betting slip automatically pop-up. Then type in your wager and click on the ‘BET NOW’ button. You’re always able to see your bet in the betting history section. The Twinspires betting platform is accessible via a browser-based client for both desktop and mobile devices. The mobile experience is optimized to mirror the computer version of the platform. Or you can choose to access the Twinspires betting platform via a mobile app available for download on iTunes or Android devices on Google Play. The mobile app has very similar features to the browser-based client, including mobile quick bets, quick deposits, live streaming, and mobile registration. If you’re always on the go, or enjoy having your bets at your fingertips, don’t miss the Twinspires Mobile App. One of the key selling points of the Twinspires Horse Racing site is the huge range of tracks and bets for you to choose from. There are currently over 300 tracks from all around the world available at Twinspires, which is the highest among American horse race betting sites. So if you’re a fan of the smaller race tracks that get missed by other American racing sites, you have found your betting home. The way the betting works at Twinspires is that every time you place a bet on the site, your wager is pooled with the wagers taken in-person at the track and your winning bets are paid at full track odds. This means that you get the same odds and the same experience as a person on the ground at the track. All of the standard wagers found on the track can also be placed online. This includes the standard win, place, show bets as well as Exacta, Trifecta, daily doubles, and pick 6s. Select to Win – the Select to Win bet is arguably the most popular type of bet which gives you a chance to simply call the winning horse of a race. The payoff for a straight selection to win are higher than Place and Show bets. Show – for show bets, the horse you pick must place within the top 3 places in the race for you to win. Since the odds of your horse finishing in first, second, or third are much higher than winning the race outright, the odds are lower than a Select to Win bet. Place – place bets require your horse to finish in either 1st or 2nd to win. Again, the odds are higher than a show bet, however, less than a Select to Win bet. Exacta – with Exacta bets you must pick the 1st and 2nd place finishers in the exact order they finish. If you pick the two winning horses but in the incorrect order, your bet will still lose. Because this bet is tough to win, the odds on Exacta bets are very high. Trifecta – Trifecta takes Exacta a step further by requiring you to pick the top three finishers of a race in correct order. The odds on Trifecta bets are extremely high, but the difficulty of winning a Trifecta is quite high as well. Daily Double – with a Daily Double bet the horses you choose must be the winner of two consecutive races. If one of your picks wins but the other loses, your bet will still lose. Since you are basically making two Select to Win bets, the odds are quite high on Daily Doubles. Pick 6 – the Pick 6 bet requires bettors to select the winners of six consecutive races. It’s extremely difficult to select six straight winners so successful wager give massive payouts, sometimes exceeding millions of dollars. Welcome Bonus 20% sign up bonus on up to $100 + a $10 free bet no deposit bonus for all new users of the site! Delta Downs Bet on the Delta Downs Meet and get your bet back each and every day if your horse finishes second! Promotions are plentiful at Twinspires, with bonuses and insurance constantly being provided both seasonally and long-term. Most promotions give you opportunities to win bonus money or cash back in case a bet loses. So you don’t miss out on any great promotions from Twinspires by subscribing to their newsletter. Twinspires offers live horse racing events on both desktop and mobile, which you can watch from your account on Twinspires TV. 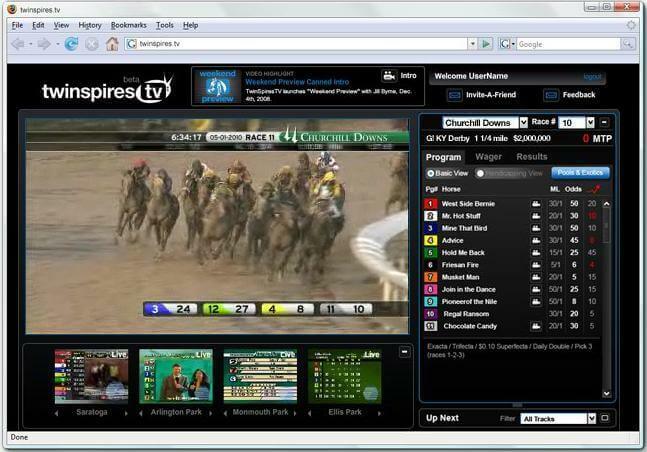 Every race on Twinspires TV is also available for viewing on the site. All races can also be viewed once they’ve finished if you visit the race replays section of the site. The main advantage of watching live races is the ability to gather information before placing your bet. With higher video resolution and increased bandwidth, Twinspires TV gives you the chance to examine horses in detail before races and monitor racetrack conditions. Twinspires TV has minimal delays, so you can see everything that’s happening in virtually real-time. Additionally, with the help of near real-time streaming, you can submit online wagers along with people at the track using the Twinspires Quick-Bet Wager Pad. Useful handicapping resources are provided by Twinspires giving you the critical information necessary to make winning bets. Take advantage of the free resources by clicking on the ‘Handicapping’ button on the main menu and selecting a race to wager on. Most races will also have other useful resources which can be purchased. These resources are from experts and they provide you with their professional picks and insights into each race, track conditions, and shape of the horses. If you’re placing larger bets, then the purchase of these top handicapping resources can be a smart purchase that prevents you from mistakenly blowing a race with bad information. Visit the handicapping section before any race as even the free information can be the difference between making a winning or losing bet. The one of a kind Twinspires Rewards Program, TSC Elite, gives loyal patrons the chance to earn generous benefits as they bet on their favorite races. All account holders at Twinspires automatically receive TSC Elite points when they place wagers through TwinSpires.com, regardless whether it is online or over the phone. The points system gives 2 points per dollar wagered on every track Twinspires shows. Bettors earn 4 points per dollar wagered when playing on select courses such as the Churchill Downs, Fairgrounds, Arlington, and Miami Valley Raceway. Issued points are valid for 12 months.A tier system is also in place at Twinspires which multiplies your rewards points based on which tier you reach. Bronze, Silver, Gold, and Platinum TSC Elite VIP levels are available and they provide an opportunity to win more and more points until reaching a whopping 11X multiplier. 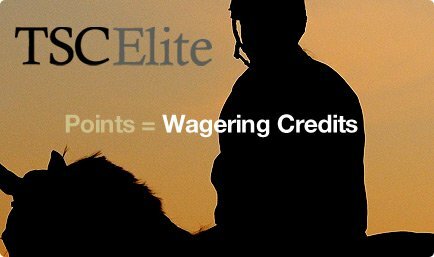 Twinspires Elite Points can be redeemed for wagering credit or used as a 20% discount on purchases made at brisnet.com. 1-877-SPIRES-1 (1-877-774-7371). Support staff is also available by e-mail, just visit the Support Section and clicking on the ‘Ask a Question’ button. Alternatively, you can search through the in-depth FAQ section for answers to common questions. A wide range of questions and answers are available in the FAQ section, so it might be a good idea to try and save some time there before attempting to call a customer support agent. Twinspires is definitely one of the leaders for online horse race betting in the US. They provide over 300 tracks with live streams which are unmatched by their competitors and have an interesting variety of races unique to Twinspires. The free handicapping resources and bonus money offers and promotions are other good aspects of Twinspires. You have plenty of chances to make educated bets with extra bonuses. The Twinspires Elite Rewards Program is worth looking into as well because the bonus points earned can be redeemed back into cash! Keep in mind that the Twinspires Welcome Bonus Offer is up for grabs. Any new bettors that join the site right now can get a 20% bonus on their wager up to $100 as well as a free $10 bet that requires no deposit. The Welcome Bonus at Twinspires must be activated during registration to be sure it’s properly credited to your account.